Computer giant Lenovo has launched a range of NFC-enabled products at CES 2014, including a 28-inch touchscreen monitor/tablet, a 14-inch Ultrabook, a 27-inch Windows 8 all-in-one PC and a touchscreen PC. The ThinkVision 28 can be used as an Android tablet or it can be hooked up to a PC and used as an ultra high resolution touchscreen monitor. Secondary devices can be paired with the display via NFC. The ThinkVision 28 will be available in selected markets from July 2014 for US$1,199. Also announced at CES is the ThinkPad X1 Carbon, a US$1,299 14-inch Ultrabook that weighs 2.9 pounds and comes with a choice of touch or non-touch HD displays, 8GB RAM and 512GB of SSD storage. With up to nine hours of battery life, the X1 Carbon packs 4G LTE, Bluetooth 4.0 and a fingerprint reader as well as NFC. 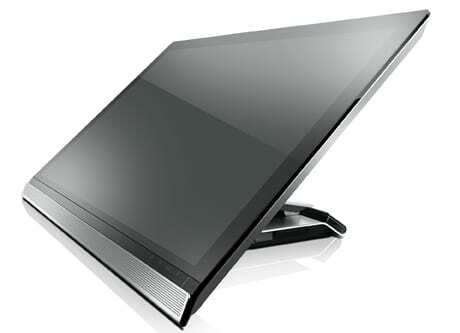 The Horizon 2 27-inch Windows 8 all-in-one PC includes NFC and offers 1080p visuals and up to 500GB of internal storage. Users can transfer data to the PC from a paired Android phone, via Bluetooth, by shaking their mobile device. The A740 all-in-one touchscreen PC has a 1080p display, 8GB of DDR3 RAM, up to 1TB internal storage and an Intel Core i7 processor within its thin 4mm frame. Both the Horizon 2 and A740 will launch in June, starting at US$1,499.